Innovative design is the key to creating a welcoming and exceptional environment for patient care. The Forever Friends Appeal aims to raise a total of £250,000 for art to create a truly pioneering Cancer Care Centre that complements the existing high quality care for patients at the Royal United Hospitals Bath (RUH). Art at the Heart will ensure that there is a clear art and design strategy for the new Cancer Care Centre. Art takes many forms, and in this instance can include integrally etched windows that could act as screens, a clever use of light and colour to brighten waiting areas, small gardens, as well as stunning pieces of artwork. In addition the hospital’s art charity hopes to include stand-out sculpture, using the landscape as an integral part of the project. 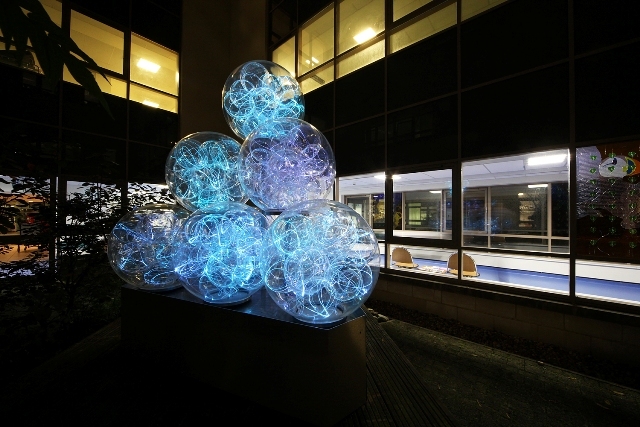 AATH have already built quite a strong collection of artworks for the new Cancer Care Centre; including ‘Brass Monkey’ by Bruce Munro, which is a vibrant light installation that will be incorporated into the building’s landscape design. The overall aim is to create a truly holistic healing environment, connecting the outside to the inside, capturing light into the building through glazing and layout, and to maximise views enhancing the whole hospital environment. Understanding the benefits of adding greenery into a built environment to help improve health is not a new concept. Taking on board this knowledge, the proposal is that landscape takes centre stage, driving the design both externally and internally.